I’m trying to install OpenMRS 1.7 (in order to upgrade it to something greater). I get the error in the attached screenshot. It leads to the databases not being created. I’m wondering if installing OpenMRS 1.7 with tomcat requires any special actions. The current lead I’m following is the possibility that the mysql installation did not work properly. (Mysql works through the GUI, but not the terminal.) I also don’t see the path to the mysql bin listed in the $PATH environmental variable. Instead the command below gives me the following output. hg:~ Harold$ echo $PATH​ ?? I’m working on a Mac OS X 10.11.3 (El Capitan). Do you have any reason for not upgrading directly to 1.11.5? You will need to paste the full log somewhere and give us the link to it. Where can I get the log? I’ll send you a link to the log soon after. Harold, What was the outcome of your attempt to get NCD running? Did you succeed? I run [ mvn clean install -DskipTests=true ] on core directory if build successfully, run [ mvn jetty:run ] on webapp directory. 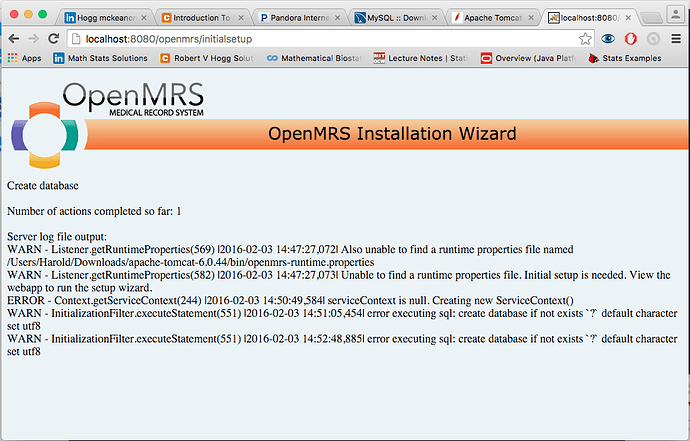 Also tried deleting ~/.Openmrs directory and re-building but error still says can’t find openmrs-runtime.properties. Can you paste the full error log at pastebin.com? Did you get this from a log file? If yes, what is the file name? Your error is not related to what is being discussed in this thread. Can you start a new thread? @hgil Were you able to create the openmrs-runtime.properties file?